After a day of thunderstorms and lightning on Tuesday, which lit up the racetrack like a battlefield, the six-boat Volvo Ocean Race fleet has settled back into some high-speed sailing across the Atlantic led by Franck Cammas/FRA and Groupama. 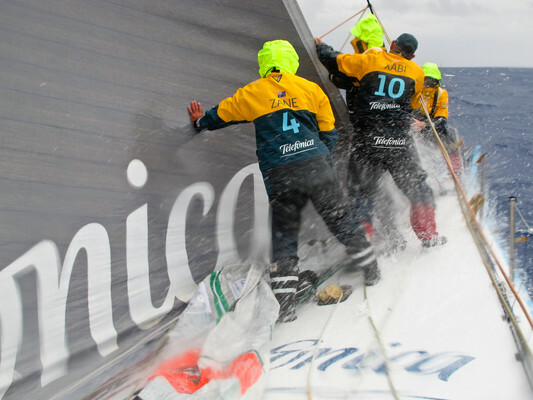 Speeds are around 18-20 knots and PUMA Ocean Racing powered by BERG (Ken Read/USA) are back up in second place, with Telefónica (Iker Martínez/ESP) in third. 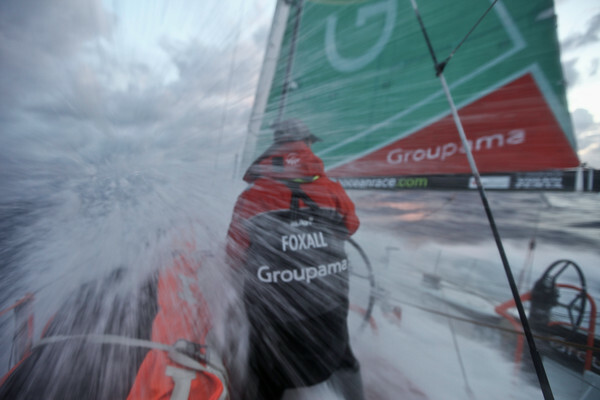 Tropical Storm Alberto wreaked havoc for five of the fleet yesterday when it changed course unexpectedly, leaving all but Groupama trapped in its centre, as a violent windshift headed the fleet straight into the eye of the storm. As the fleet crashed off some terrible waves, the most worrying aspect was the lightning striking all around, right down to the water. “It didn’t seem possible that our carbon mast could avoid a direct strike,” Walker added. CAMPER with Emirates Team New Zealand was one of the worst affected teams. 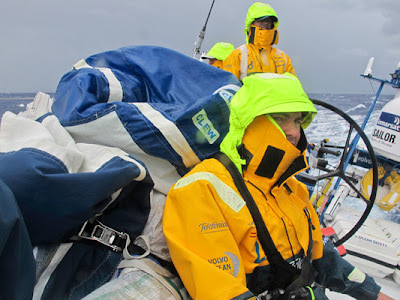 “Unfortunately, yesterday we had probably one of the worst skeds of the whole race so far, dropping close to 25 miles on the other boats,” said skipper Chris Nicholson. 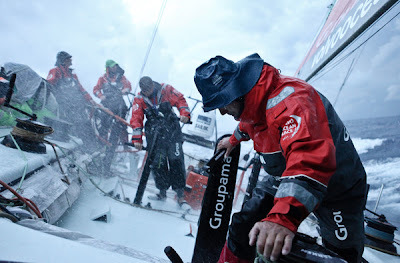 Groupama meanwhile had managed to avoid the storm by gybing early and pulled out a lead of 70 miles or so while carnage ensued astern. 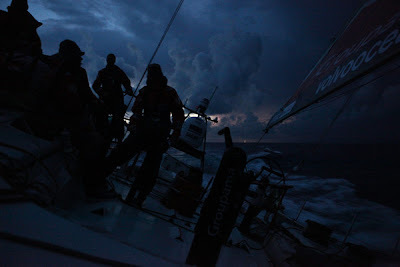 However, the fleet eventually escaped, sailing back on themselves to the favoured side of the storm to get back on track. 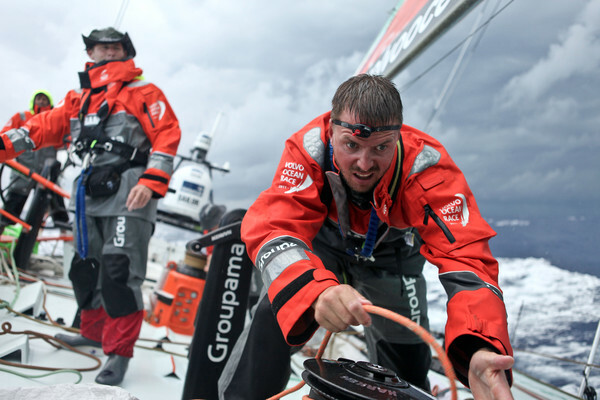 At 0700 GMT, Groupama’s lead had been reduced as the fleet settled back on course, with PUMA Ocean Racing powered by BERG just 26 nm astern of the green boat. 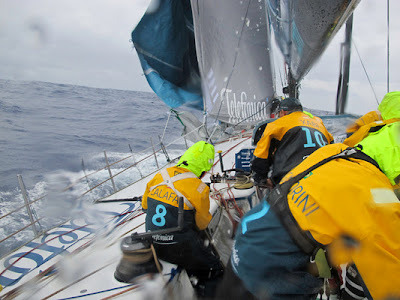 As all teams made gains on the leader in the past three hours, the split from first to Sanya (Mike Sanderson/NZL) in sixth place has been reduced to 52.8 nm as the fleet blast along in 15 – 19 knots of wind.